The Savoia-Marchetti S.55 was a double-hulled flying boat produced in Italy beginning in 1924. Shortly after its introduction it began setting records for speed, payload, altitude and range. 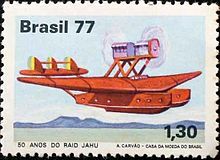 The Brazilian Jox�o Ribeiro de Barros and his crew of three made an Atlantic crossing in the S.55 "Jahx�" on 24 April 1927. Departing Santiago Island Beach, he crossed the Atlantic in the "Jahx�" and landed at Fernando de Noronha Island, Brazil. 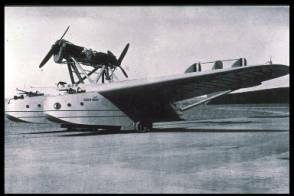 The Savoia-Marchetti S.55 was one of the first aircraft to cross the Atlantic Ocean when the Santa Maria under Francesco de Pinedo made the crossing between Dakar, Senegal and Pernambuco, Brazil setting out on 13 February 1927 - more than three months before Charles Lindbergh's first solo crossing. After that crossing, the aircraft were sold to Brazil, which paid in coffee. Pilots Francesco de Pinedo and Carlo del Prete took off from Sesto Calende, Italy, in an S-55 and headed west across the South Atlantic. Four months later, they arrived back in Italy, having flown nearly 48,280 km (30,000 mi) in 193 flying hours and having made just over 50 stops, including Rio de Janeiro, Buenos Aires and New York City. The Italian Air Marshall of the time, Italo Balbo soon became famous for organizing fleets of S.55s for Atlantic crossings, culminating in his 1933 flight with 24 aircraft to Chicago's Century of Progress International Exposition. On 1 July 1933, General Balbo commanded a flight of S-55s from Orbetello, Italy, completing the flight in just over 48 hours, maintaining a tight "V" formation. These large fleets of aircraft became so well known that even today a large formation is sometimes called a "Balbo". The aircraft went on to serve the Italian Air Force and the Luftwaffe as a long-range bomber and patrol aircraft, but by World War II, the last 13 S.55s were no longer serviceable and were kept in reserve. The last remaining example is preserved in Brazil, at the TAM "Asas de um sonho" museum, at Sx�o Carlos, Sx�o Paulo. The aircraft, registered I-BAUQ, was the S.55 used by Cmdr. Jox�o Ribeiro de Barros in his crossing of the South Atlantic in 1927. Prototypes and early production delivered 1927 to 1930, 88 built plus two prototypes. Civil variant delivered 1925 to 1926, eight built. Improved civil variant with enlarged hull for 10 passengers and enclosed cockpits delivered from 1928 to 1932, 23 built. Military variant delivered with 418 kW (560 hp) Fiat A.22R engines, 16 built. Variant with some wood structures replaced by metal, seven built by Piaggio in 1930. Enlarged hull, based on the S.55A but fitted with a wider and deeper hull and enclosed cockpits, 16 built by Savoia-Marchetti and 16 built by CANT. Very enlarged hull, variant with further modified hulls, 20 built by Savoia-Marchetti, 16 built by Macchi and six built by CANT. Variant fitted with Isotta-Fraschini Asso 750 engines for North Atlantic formation flights, later armed and used as a reconnaissance-bomber.